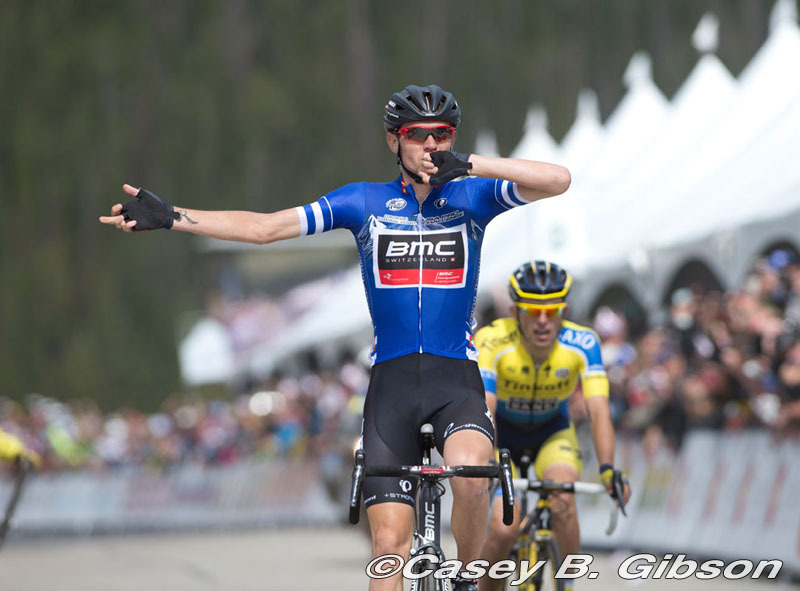 In a race fit for royals, Tejay van Garderen (BMC Racing Team) proved he is King of the Mountains during the Queen Stage of the 2014 USA Pro Challenge on Monarch Mountain, in the race's first-ever mountaintop finish. Taking the stage win and the overall lead, in addition to the Lexus Sprint Jersey and the Colorado National Guard Best Colorado Rider Jersey, van Garderen dominated Stage 3 of the race. "I love this race. Every year I've done the Pro Challenge, I've taken away something from it," said van Garderen. "I look forward to this race every year. And unless the Pro Challenge finished higher than this before, this is definitely the highest elevation I have ever finished at." "Today's stage was everything we could have hoped for – the fans were incredible, the weather was beautiful, and the racing was intense and exciting to watch," said Shawn Hunter, CEO of the Pro Challenge. "This is the first year we have taken the Pro Challenge to Monarch Mountain and our first true mountaintop finish. As the race continues to grow and evolve each year, we hope to bring more exciting days of racing like today to our fans around the world." After a 6.9-mile neutral start out of town, the riders didn't waste any time and immediately started launching attacks, traveling at 32 mph. With a lot of activity on the front, none of the breaks were able to stick and everyone was still riding together at 35K into the race. At 50K, five riders, including Michael Koch (Cannondale Pro Cycling), Jeff Louder (UnitedHealthcare Pro Cycling Team), Ben Jacques-Maynes (Jamis-Hagens Berman p/b Sutter Home), Jacob Rathe (Jelly Belly p/b Maxxis) and Bernie Sulzberger (Drapac Pro Cycling), broke away and gained a slight advantage, but then were reeled back in as they headed into the first Sierra Nevada KOM of the day at Monarch Pass. A Cat. 1 climb at 11,312 ft. with a 2,743 ft. elevation gain, Monarch Pass would prove to be a test for the riders, splitting the field into several different groups. Janier Acevedo (Team Garmin-Sharp) put his climbing skills on display by pulling ahead and, with his team setting a tough pace in the group just behind, the break was cut down to just eight riders. Included in this group were Tejay van Garderen and Ben Hermans (BMC Racing Team); Rafal Majka, Michael Rogers and Pawel Poljanski (Tinkoff-Saxo) Tom Danielson and Acevedo; and Carter Jones (Optum p/b Kelly Benefit Strategies). 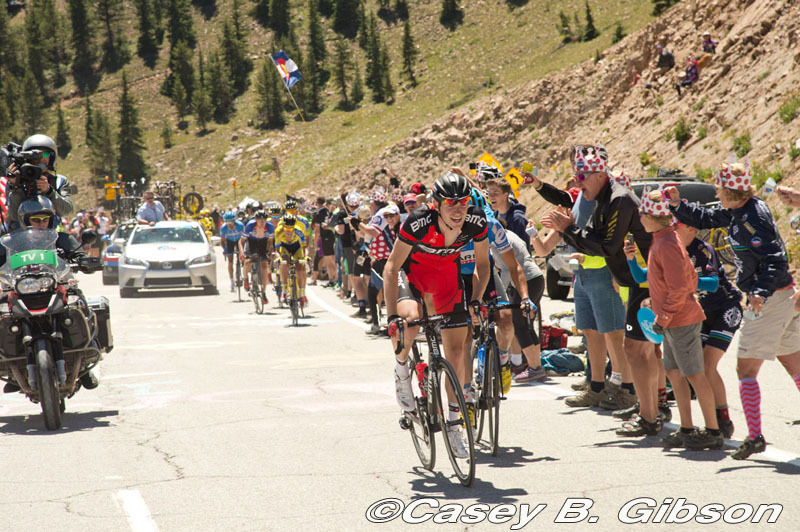 Lined with fans, the climb up Monarch Pass destroyed the field and broke the riders up into several small groups. Reaching the top of the climb first was Hermans, followed by Danielson and Poljanski. With about a 50-second advantage, the break screamed down the back side of the climb, past the stage finish and on to Salida where they would complete two laps before heading back toward the finish. With the first Lexus Sprint Line in Salida fast approaching, Acevedo hit the line first, followed by Poljanski and Hermans. Soon after, Rogers broke off, as the rest of the break was absorbed back into the chase. As they continued on through the town, several attacks were made out of the chase, but didn't stick. Then, just as Rogers hit the second sprint line of the day, taking max points, Lucas Euser (UnitedHealthcare Pro Cycling )Team and Daniel Jaramillo (Jamis-Hagens Berman) managed to escape and start the chase. Euser crossed the line second and Jaramillo third. 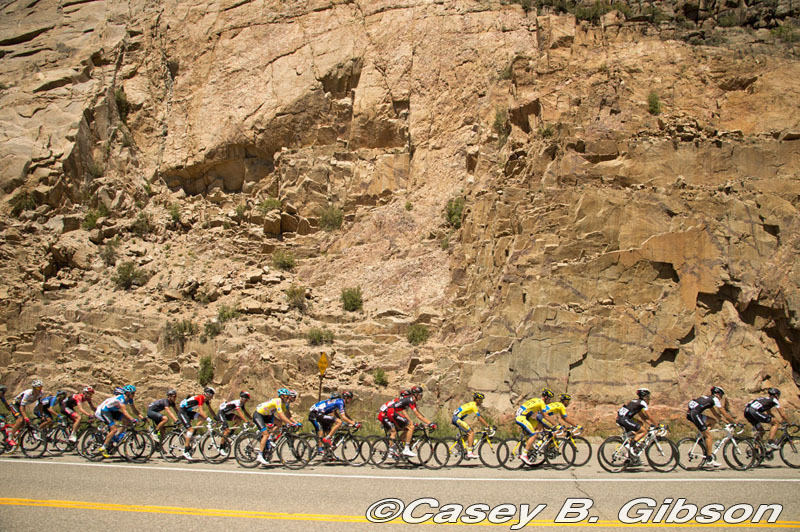 As the riders left the town of Salida, Rogers maintained a 1:10 lead over the first chase group with Euser and Jaramillo, and 20 seconds behind them was the second chase group, which included GC leader Alex Howes (Team Garmin-Sharp). With only 16.5 miles to go, the chasers were reabsorbed, tightening up the race. At 8K to go the attacks began and, as the tempo picked up, riders began to fall off the back. With about 14 riders left in the front group, Danielson tried to push the pace to get time on van Garderen. Finally Matthew Busche (Trek Factory Racing) launched an attack and put a gap between him and the group, but alas, that wouldn't stick either. With 1K left in the race, van Garderen hit the gas and attacked, a move which would take him all the way to the finish line. Under beautiful skies and a picturesque backdrop at the Monarch Mountain Ski Resort, van Garderen crossed the line first, followed by Majka and Serghei Tvetcov (Jelly Belly p/b Maxxis). "I felt pretty well under control today," added van Garderen. "The team rode incredibly again today. I'm glad I was able to take the jersey." Van Garderen now holds three jerseys, including the Smashburger Leader Jersey, Sierra Nevada King of the Mountains Jersey and the Colorado National Guard Best Colorado Rider Jersey. Rogers was awarded the FirstBank Most Aggressive Rider Jersey for his riding in the breakaway. The other jerseys remained unchanged, with Kiel Reijnen (UnitedHealthcare Pro Cycling Team) holding onto the Lexus Sprint Jersey and Clément Chevrier (Bissell Development Team) maintaining the Colorado State University Best Young Rider Jersey. 2 Rafal Majka (Pol) Tinkoff-Saxo at s.t. 5 Thomas Danielson (USA) Team Garmin-Sharp s.t. 18 Alex Howes (USA) Team Garmin-Sharp all s.t. 44 Jose Joao Pimenta Costa Mendes (Por) Team Netapp-Endura all s.t. 123 Johnathan Freter (USA) Jelly Belly p/b Maxxis all s.t. 26 Tanner Putt (USA) Bissell Development Team s.t. 65 Adam Phelan (Aus) Drapac Professional Cycling s.t. 76 James Oram (NZl) Bissell Development Team s.t. 100 Elliott Porter (GBr) Rapha Condor JLT s.t.